I wasn’t planning on riding down to the running club this morning. In fact I was thinking about just keeping today’s ride to 25 miles because my legs are pretty smoked after a nice 5k run on Thursday. Once I got going though, I threw the initial plan to the wind to make it an even 30. The wind was dead out of the south so the ride down was a bear. Of course, that meant the ride home would be fast and fun. I got down to Grateful Jim’s house, said hello to a few of the guys and went inside. I weighed myself for the first time since May, or maybe early June. I’m the exact same weight, 170 pounds. This is, of course, the goal of most who pick up exercise to lose weight, to naturally regulate caloric intake and exercise – it certainly was a goal of mine. The return ride was almost as fun as I’d anticipated. As happens so often, the stinking wind shifted west a little bit. Oh well, better than a headwind. Have an awesome weekend folks, we’ll be complaining about the snow soon enough. In my post yesterday, I wrote about a serious lack of speed I’ve been suffering through for a couple of weeks now. Two weeks ago, when I got dropped on the Assenmacher 100 after 45 miles at only 22 mph, I was concerned but not too worried. There were plenty of factors that could have led to that. Because I haven’t been tracking my rides lately I figured, “Hey, I’ll push through it, I just need to work a little harder to get my form back”. I set about it, pushing hard over the next several days before taking it easy on Saturday and riding hard on Sunday with a couple of friends, well it felt like a hard 60… I was a little perplexed by the 18.6 mph average but there were a couple of really slow miles during stops that brought my average down. We were closer to 19, so I thought I was coming back and all was well. Monday I took it easy so I could save some for the club ride. Tuesday’s ride was rough.. I dropped off after 8 miles thinking we were flirting with 25-26 mph with only five in our group. I figured I’d finish with an average just shy of 20 mph… It was 18 even and that was the straw that meant something was seriously wrong… No way I worked that hard for only 18 mph – that was easy a 20 effort. 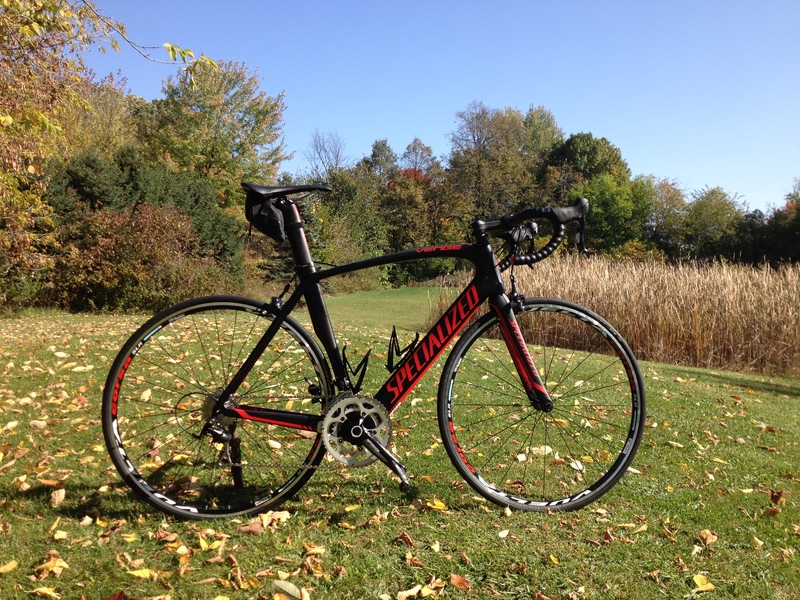 In that last post I also mentioned that I had swapped saddles with my 5200 (because the Spec. Romin from the Trek matched the Venge better, naturally). When I swapped saddles, I forgot to note the position on the rail before I took the original Romin off. Oops. Yup, that’s getting stuck by a train, two stop lights and a couple of stop signs (I use auto-pause but it doesn’t pause till I’m dead stopped for a few seconds). In other words, that’s closer to 20 than 19. So, how much, exactly, was I off by? Between six and seven millimeters at the saddle. This meant that, at the pedals, my knees were too far forward by more than three centimeters (more than an inch). That also meant that my saddle was too low by a few millimeters… Which meant I was so far out of position that my power to the pedals, even though I was working hard, was crap. Cycling is about balancing power and aerodynamics, so they say. In my case, riding with the saddle where I had it two days ago was very aerodynamic… I could get my head lower, out of the wind. Unfortunately I had to give up breathing and power to get there. Now, that 19.2 (it was 19.4 before the last mile but I slowed it down quite a bit to cool down) was after a really hard 30 miles the day before, even if that 30 was slow – which meant my legs weren’t in the best shape for the little test. Still, getting my saddle in the right position meant that I could recover from surges a lot faster because I was breathing more deeply. That translated into a slower lactic acid buildup and the ability to sustain a greater effort for a longer period of time than just one day earlier… Bob’s my uncle. Now, undoubtedly, I have a little work to do on effort too, I know I’ve been taking it a little easier than I’d like and now that my saddle is back to where it should be, it’ll be possible to focus my attention there. In all, this was an arrogant mistake. I was cocky enough to believe that I could line my saddle up by feel rather than simply putting a level or plum-bob to it. After all, I have all of those miles in and a small change feels like a boulder under the mattress… Two weeks of consternation could have been avoided with two minutes and a level. I’m in trouble. Big time. Last night at the club ride we had a small but potent group. The (newly crowned) US National Sprint Triathlon Champion (in his age group, I think it’s 65), two racers, Carla (a fitness professor at a local college) and me. I made it eight miles with that group before falling off the back. This wasn’t a surprise, there were only five of us in a double pace line and my line had three, so I was pulling every three miles (every other at first, we were joined by the third after a few miles) at speeds I figured were between 23 & 24 mph. I fell off when we picked up two more racers and I knew what was coming next (turns out I was wrong by the way, had I just hung on, the group actually waited for Carla who is usually just a touch slower than me)… Now, this was all into the wind, with a cross wind or into a cross-headwind. When I fell off, it was cross-headwind or headwind for another twelve miles. It sucked but I pushed through it. With eleven miles to go I was able to pick up the pace a bit with a cross-tailwind/tailwind… Then my phone started ringing off the hook, so to speak, and I had to take a call that lasted between three and four minutes (so my speed obviously took a serious nosedive). I picked it back up for the last few miles and checked my average speed. With the exception of that mile I was on the phone yelling at one of my guys, I worked pretty hard and figured I’d be around 19 mph average (minus a half for the phone call – I was down to 10 mph for about a mile)… 18mph average. Unbelievable. Not acceptable. 18 mph is a ride through the park, I shouldn’t even be breathing heavy at that pace… An easy spin – I’ve got a serious problem. I have a major mechanical issue to start with. A couple of weeks ago I switched saddles and eyeballed the position before dialing it in by feel. I haven’t really been comfortable since, listless really. It feels close, but just not right. So when I get home from the office today, the first thing I’ll have to look at is the saddle position and get that dialed in properly. I’ll have more as I’m sure this saga will take a minute to sort out. One thing is certain though – I’ve got some work to do because this will not become the norm. PS. Just in case you are wondering, this is not an over-training thing. That’s a period on the end of that sentence. My girls are having a sleepover, they both have a friend. What does that mean? Five against one… I have broad shoulders but folks, that’s an estrogen overload right there. What Ails You? Now, Do You Want to get Better, or Not? August 26, 2014 10:16 am / 4 Comments on What Ails You? Now, Do You Want to get Better, or Not? The second time I heard the song the idea for this post came to me. I know a lot of recovering people and I was a very rare bird in that group. When I quit drinking in ’92 I really had enough, at just 22 years-old, I was completely out of control. I was the bloodied MMA fighter in a choke hold wildly tapping out mere seconds before I blacked out. More importantly, I was willing to do anything (legal) to quit. I just wanted the pain caused by my stupidity, lethargy and addiction to stop. There’s nothing quite like that feeling. It’s scary as all hell. However, once the decision was made and I put my first foot on the path of recovery, it was elation, even if that elation was short lived – after that I had to get to work cleaning up the wreckage and that was no fun, till it was done – but then came freedom. The point is, and what this song does for me, it reminds me that it’s all pretty simple; I just want to get better. All of those things destroy my spirit over time, they make life impossible to enjoy because it’s always one calamity after another, one bad decision after another, if I don’t. It’s really that simple*. *Please note, I did not use the word “easy”. Giving up that which holds me down is anything but easy, especially when it comes to excuses (others call them “reasons”). Now, in case you may wonder, this principle works for everything, even something as minor as cycling (or running and swimming). If I’m going through a tough spell, and we all have them, I want to get better. I have to do a little inventory of what’s holding me back (usually it’s located somewhere in the gray matter between my ears) and knock it off. I got dropped on my century a week back. What’s the problem? I’ve been taking it a little too easy, not working hard enough. That had its effects over a month and I slowed down (naturally). I want to get better. As soon as I identified the problem, I didn’t even bother with the lying, excuses, BS and procrastination, I just got to fixing the problem. I am getting better. It’s only rocket science if I hold on to that which holds me back. This Picture Is Killing Me! It doesn’t matter how hard I try not to laugh I still lose it. This is probably one of the best pictures in the internet. 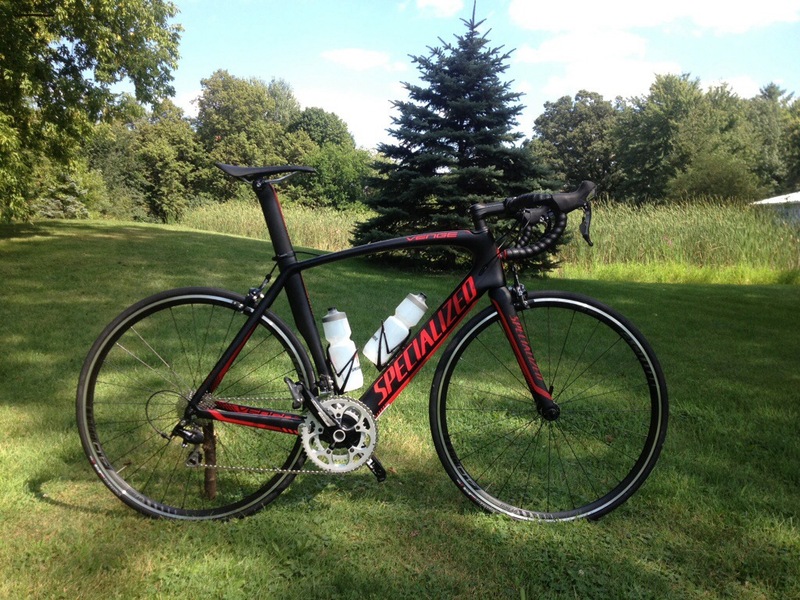 Saturday was the one year anniversary of the day I brought my Specialized Venge home. Nothing I’ve bought since I decided to get fit more than a decade ago in my adult life has had such huge impact on my enjoyment of fitness and life in general. While it is still a bike and in order to get anywhere it must be pedaled, it is the one material item that I own that puts a real smile on my face. Riding my Venge makes me happy. I just can’t stand my bike looking like a Ballchinian. PS. Don’t ever let anyone tell you that the wheels don’t matter. They make the bike.